This is a review of the ‘Hooded’ box. The ‘Hooded’ box features a single, but high-end, product – a hoodie from Richer Poorer. There are a few color choices for this month’s selection – I’ve gone with that classic gray hoodie, and I’m absolutely loving the quality! It’s 100% cotton, durable, and heavy – it is absolutely perfect for this fifth-coming of winter. While the outside is soft, the inside has a terrycloth feeling to it – I tend to like that better than a fleece lining – so this is perfect for me. The fit is perfect – a bit snug, but that feels great! This is one I’m comfortable wearing out or just around the house. Verdict: While it may be less exciting that it’s only one product, you’re getting the hoodie at a big discount – and it’s a perfect hoodie! This was a great selection for me. 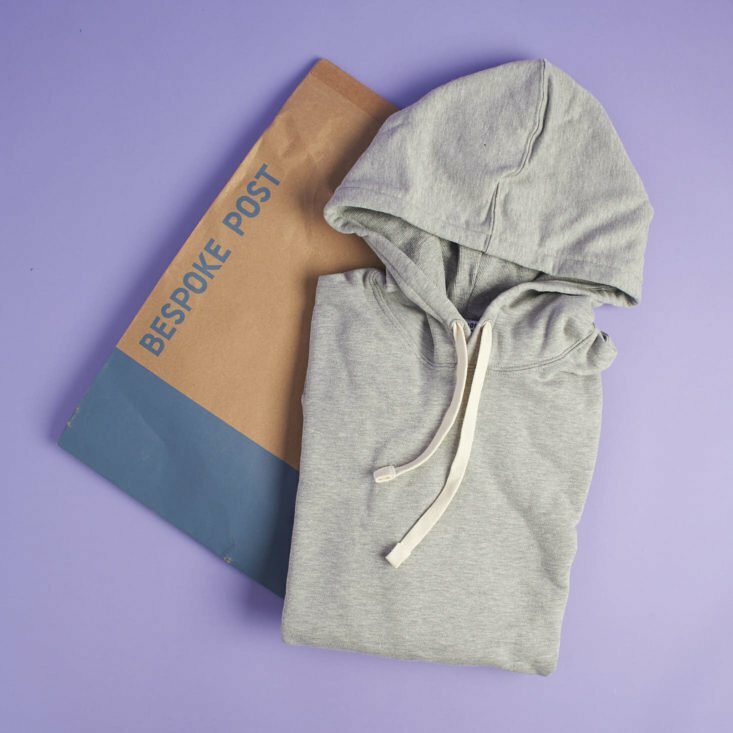 What do you think of the Hooded Bespoke Post box? That looks nice on you. I wish they offered one for women as well. I wore out my hoodies this winter! I agree. Disappointing that the sizes are limited. My 22 yr old son is 6’4” and broad shouldered. He wears a 2X like a lot of other men. If Bespoke Post can offer something more people can wear, they might draw a lot more clientele. I subbed for this box for the culinary aspect, hubby is a closet gourmet cook! 🙂 I just got the indoor grill that is smokeless and it’s pretty cool. Just wish I could take advantage of the clothing aspect for him. Eric, that hoodie looks great on you! I actually got this sub for me, so I tend toward kitchen stuff. I’m getting “Honed” this month. But since DH is a whiskey aficionado, I’ve found some great boxes for him, too!